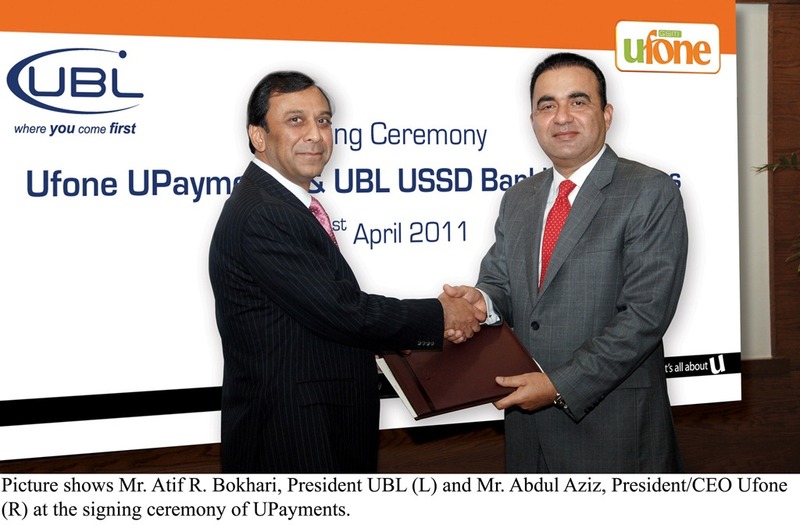 UBL and Ufone have announced a partnership to bring easy access to financial services to their common customers through Ufone’s Upayments Service. UPayments is a USSD based secure session service that is customer friendly and has no handset limitation whatsoever. This joint venture will allow common customers of both UBL and Ufone to add credit to their Ufone prepaid service and pay their Ufone postpay bills directly from their handsets. With this strategic partnership customers get the freedom to pay bills of 15 Utility Companies offered by UBL irrespective of their location and time. They no longer have to worry about running to different outlets to pay their bills. Most importantly Ufone customers can avail these services while roaming anywhere in the world thanks to Ufone’s vast International Roaming network and the presence of UBL in 11 different countries apart from over 1100 branches in Pakistan. All one needs is a UBL bank account to enjoy this trouble free service. Mr. Abdul Aziz CEO Ufone said that this strategic partnership is a milestone in our journey to extend the reach of UPayments to all banked customers which will serve as a trusted platform for the whole banking industry. This is the start to many other features and services which will eventually allow Ufone’s valued customers to use their handsets for all financial transactions. At Ufone we believe in developing partnerships and invite all banks to join hands to better facilitate and serve our common customers under our trusted USSD platform of UPayments. you can’t access ubl.com.pk but yes http://www.ubl.com.pk works, but today you can’t access even that. wasn’t their agreement with HBL before???? ?